I came up with an interesting idea that I tried out tonight. We had two friends over for dinner and the verdict was that the idea was a resounding success! I removed the thicker portions of the stem of kale leaves after steaming them just long enough (about 3 minutes?) to soften the leaves. I rolled the leaves and stuffed them with polenta and seitan, put them all in a casserole dish, added olive-artichoke heart salsa, and baked for about 15 minutes in a 350 degF or so oven. It came out tasting well and not as messy as I had thought! I hope to try this again sometime with larger kale leaves and maybe some sort of mechanism to keep the rollups together. I also made mashed potatoes with a variety of ingredients, including shallots, water left from steaming the kale, dill weed, fresh rosemary, and various seasonings - then I mixed in the potato wedges I had leftover from day before yesterday, chopping them a bit as I mixed. (I also served leftover corn from that meal.) 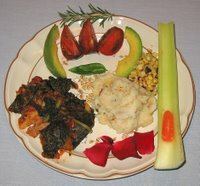 Some organic 'Taboo' rose petals from my garden and salad ingredients rounded out the filling meal. My wife returned tonight from her class and I made a simple dish so that we could go out to see a film. I recently bought Hodgson Mill organic whole wheat fettuccine with milled flax seed, and used it as a base for dinner. Bolognese is a sauce that traditionally is made with meat; I found a premium vegan Bolognese sauce in the store a week or so back, which uses textured vegetable protein. I simmered the sauce with mushrooms, fresh herbs, chunks of tempeh, and seasonings (salt and crushed red pepper). 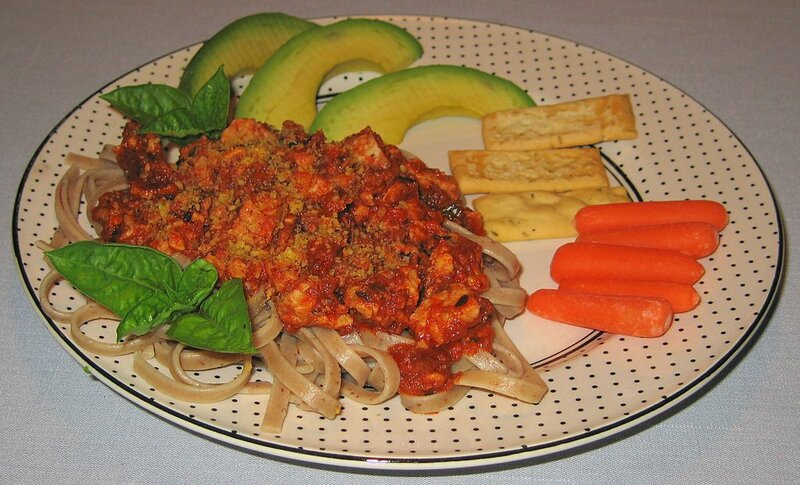 I served the pasta with the sauce, topping with vegan Parm! "Parmesan" cheese, and also serving rosemary crostini. It was good! I think I'm going to try making my own Bolognese sauce sometime by preparing a soffritto base saute of garlic, onion, porcini mushrooms, and carrots, then adding and browning small chunks of seitan. Then I'll put in some white wine, reduce it, and then a little tomato paste or sauce and a little stock, simmering for 20 minutes or so. I love fresh corn-on-the-cob and get around its sticking in one's teeth by preparing it this way. I roast it over an open flame then use a corn stripper or, more usually, I just take a knife and run it down in vertical strokes, cutting the kernels off. Then I mix in a non-hydrogenated vegan margarine like Earth Balance®, along with spices (tonight I used just some salt and freshly ground black pepper, but I also added some fresh oregano; sometimes I also add a little paprika or chili powder) and lime or lemon juice. It's so good! Anyway, my wife is still away taking a class, so it was again just me for dinner. I have been relishing the arrival of organic corn so I could prepare my simple but tasty corn-off-the-cob. Yesterday when I was shopping, they had some conventional corn on clearance; I couldn't resist, though I wish it were organic. 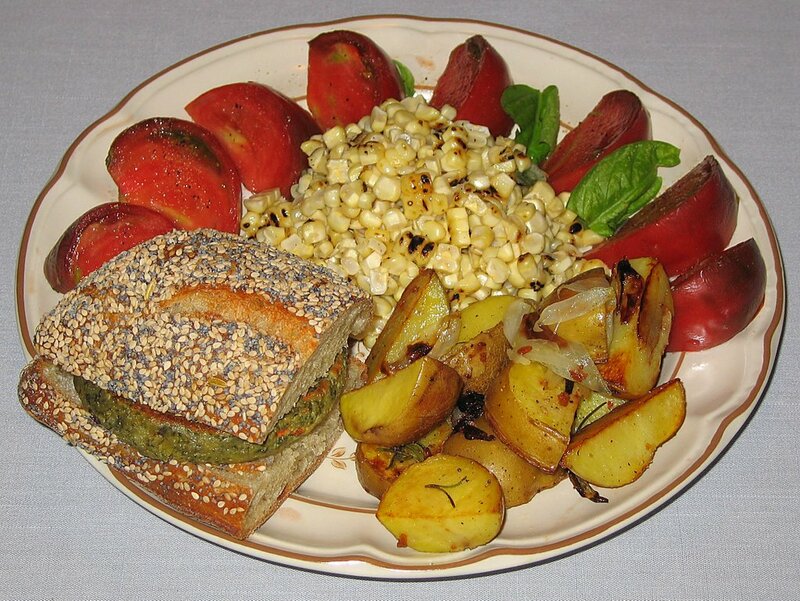 I prepared the corn along with a simple potato dish with rosemary, olive oil, and salt. I also served an organic soy-free sunshine burger on seeded ciabatta, and heirloom tomato pieces. I have a great class that efficiently works well together. Most of my previous classes get the Italian dinner on the table around 8:45-9 (the last class served close to 9:30, and we have to be out of the facility by 9:45! ), but this class was ready to eat around 8:20! We were leisurely able to eat, cleanup, and saunter out by 9:30 or so. Today they made my recipes of Italian-inspired dishes. I rarely cook with tofu (it bothers my wife's stomach and also can bother mine), but the main course of eggplant saute today did use a herbed tofu. The orzo is served with herbs and lime zest. I showed my students how to make a simple polenta side dish, starting with prepared polenta available in wrapped tubes. 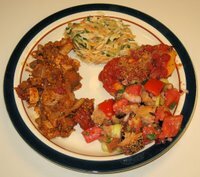 The panzanella (bread salad) was great, as it always is - this dish is often chosen as the best that we make in the entire series of six cooking classes. And - the dessert, blueberry crisp (not shown here), is sometimes also chosen as the best dessert, though the chocolate baklava we'll be making in a few weeks usually beats it out, and the orangey rice pudding from next week may garner a few votes. My wife is away for a few days, so I thought this would be a good evening to finish up some leftovers. 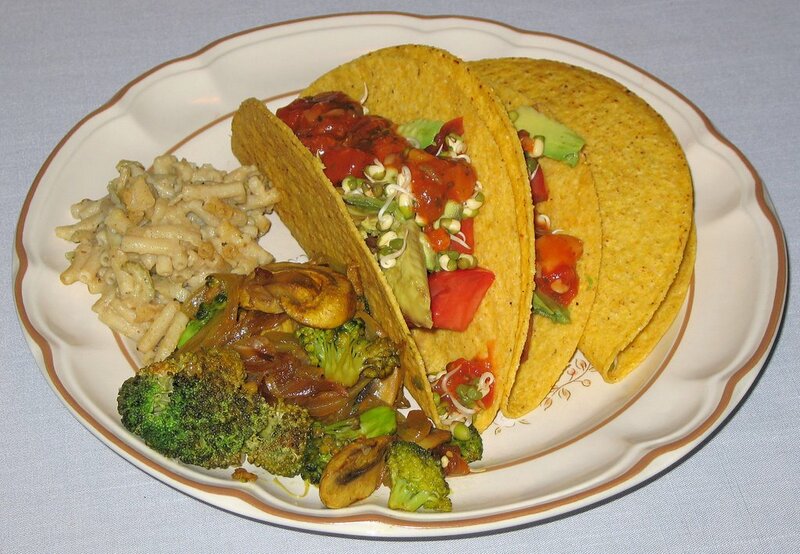 I finished Friday's mushroom-broccoli saute and the previous Friday's (yikes - I shouldn't have let it be for so long) macaroni to accompany three large tacos with avocado, heirloom tomato, sprouts, and an olive-artichoke salsa. 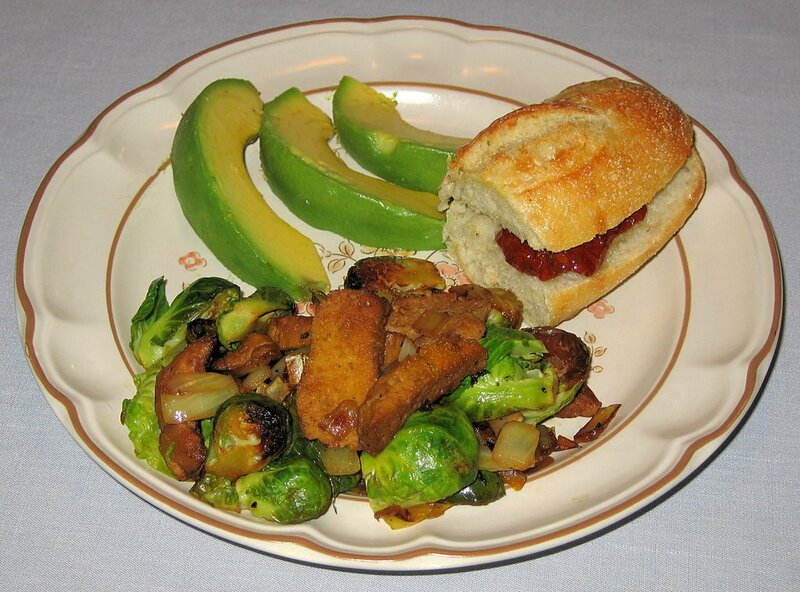 This past Monday when I made a Brussels sprouts dish with seitan, I received a good comment from a friend that she made a Brussels sprouts dish with garlic and a touch of lemon. I was going to try a simple garlic - Brussels sprouts saute and put some lemon zest in, but came up with another idea (but still intend on trying a dish based on the comment soon). I sliced Brussels sprouts in half and put them in my vegetable steamer, along with some hand shredded kale leaves - two very healthy vegetables, healthily prepared! I steamed for about 10 minutes and then tossed in some sweet Vidalia onion slivers, and let it all sit in the remaining steam for a few minutes. In the meantime, I put into a glass bowl some Greek artisinal extra virgin olive oil, herbs from my garden, salt, freshly ground black pepper, and lime juice, and heated the bowl in a 350° F toaster oven for about 10-15 minutes. I put the vegetables into a bowl and mixed in the heated oil. Then I zested an organic orange (I would have prefered lemon but couldn't find an organic one in the store today), mixed it in, and added a little more zest to the top of each served portion. The dish came out well! I also made a pilaf out of brown Basmati rice. I put a little bit of canola oil in a small pan and, over medium heat, sauteed for about half a minute a little bit of onion; added the rice and sauteed it for another half minute, stirring almost constantly; and then added a few pinches of cumin seed, sauteeing it for 10 seconds or so, stirring. I then added vegetable broth (ratio of 2 broth or water to 1 brown Basmati rice) and a pinch of turmeric, and brought it to a boil. I reduced the heat to a low simmer for about 40 minutes; in the last 10 minutes, I tossed in some broccoli florets. I fluffed it all up just before serving. I included with dinner diced tomatoes and diced homegrown basil with lime juice, freshly ground black pepper, and salt, as well as a garnish (that my wife and I both ate) of freshly picked organic rose petals from my garden. We picked up (Weaver Street Market only makes this on weekends!) the great lemon rosemary boule bread that we love - and this loaf was exceptionally good (or maybe it's just that it was only a few hours old). 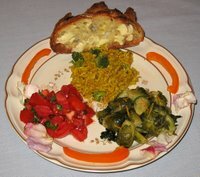 It was a good dinner - I'd like to buy more Brussels sprouts soon! Yesterday we were in Raleigh and ran out of time before having to rush to a performance. My wife likes the Raleigh Whole Foods pizza, so we bought a few vegan slices and assorted hot and cold foods from the salad bar for a filling meal before the show. Tonight I made a simple saute with mushrooms, onions, and broccoli. I served it with Himalayan Red rice and seeded ciabatta (Italian "slipper" bread - called because of its shape) toast. We've been eating out a lot! Last night I taught, so as we usually do, we ate out after my class. We had a good meal at Margaret's Cantina in Chapel Hill. They are well aware of vegan dining, and we had combinations of enchiladas and tacos with vegetables and tempeh, along with good, hearty brown Mexican rice and black beans that my wife enjoyed (I did, too, but just sampled a few - my stomach sometimes doesn't tolerate beans). We also had some good in-house made white peach sorbet. The night before, Wednesday the 19th, I also taught, but in the late afternoon. It wouldn't have been a problem cooking, but we were going to a dance performance and my wife was working out-of-town and would arrive with not much time before the show. So we met at Pop's trattoria near the performance and had salad and a reasonable (but not as tasty as I remember that they have made in the past) wood oven-fired pizza sans cheese. Tonight was the first of six nights (Tuesdays, skipping August 15 and ending on August 29) of the vegan cooking class that I teach. This is the cooking of my students - today was mostly lecture and getting to know each other, and they had about 45m to put together this dish named after a friend's visits. I had a friend at Brown University in graduate school who would go to work on boats for weeks at a time and come back at indeterminate times for just a few days. Rather than pay rent, she stored her items at my place and stayed over the few days when she was in town. Hospitality is important to me, and I would prepare dinner for her when she arrived - including, as I recall, at 3 in the morning at least once. So what do you do when a hungry friend shows up at your home at 3 a.m.? My answer is tonight's dinner. 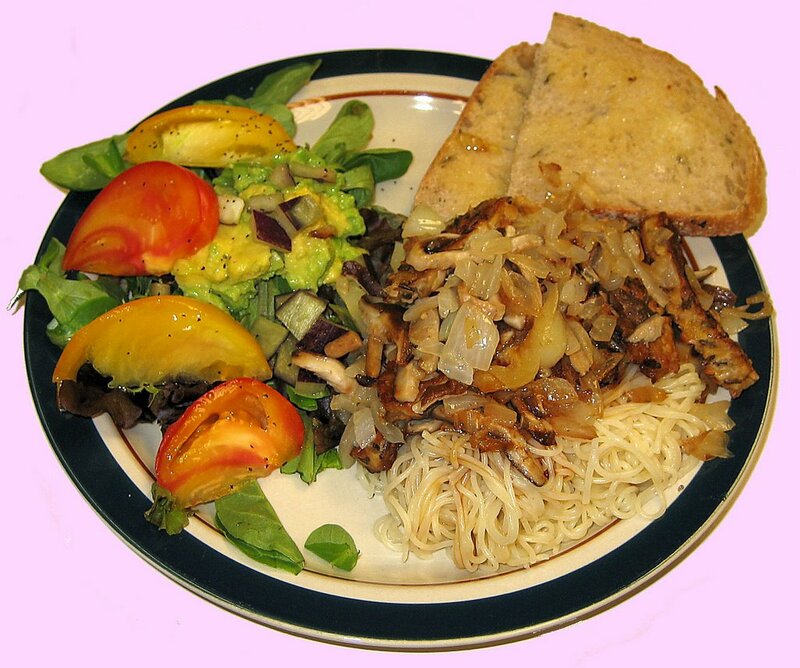 You make a quick saute of tempeh, shiitake mushrooms, and onions, and serve it over pasta with salad and bread/toast. I am lucky that my classes attract such fun and interesting students, and this new class is certainly no exception! I am looking forward to these classes; two of my friends are taking it, and everybody seems quite nice. It's been too long since I've made Brussels sprouts, and when I found them in the store today, I bought them. I tried sauteeing them with onion and thickly sliced seitan, then seasoning with a variety of spices such as turmeric and freshly ground black pepper. It came out great! I also served some fresh Italian bread (purchased frozen and baked at home) with sundried tomatoes, and slices of Reed avocado. Yesterday we were out and hungry, so just ate at El Rodeo Mexican Restaurant; the serving size was modest and the food reasonable - I had a potato enchilada and mushroom burrito. 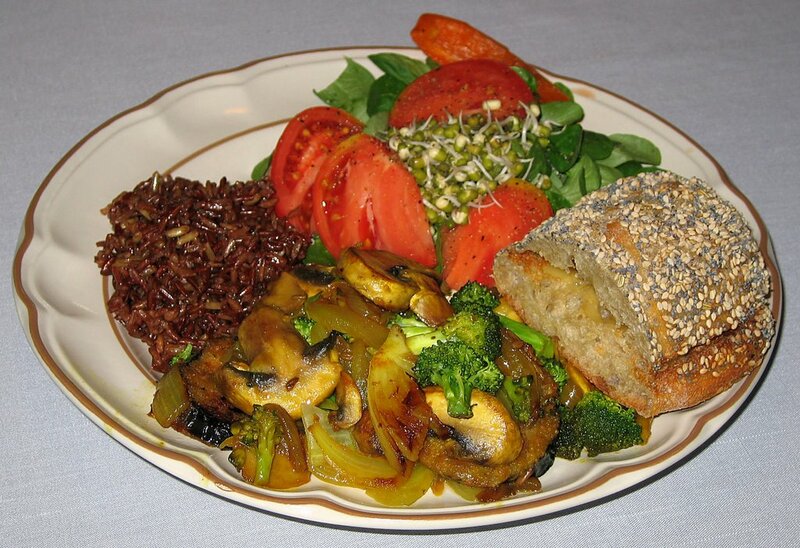 On Saturday, we had a potluck dinner, for which I prepared a rice and tempeh dish. Tomorrow I have a new cooking class beginning, so my students will be cooking for six of the next seven Tuesdays (we're not having class on August 15)! Tonight my wife was out and I had limited time before leaving to attend a film, so I put together a simple dish that I don't think she would like. Even before becoming vegan, she didn't like cheese, but I certainly did. I very occasionally enjoy the comfort food Road's End Organics Macaroni and Alfredo-Style "Chreese", and I served that with wheat English muffins and big slices of avocado. Yesterday I taught, and was excited to eat at Aurora in Chapel Hill. I used to love eating here when it was in Carrboro; fine Italian dining awaited the vegan diner who called in the morning when they made their fresh pasta - a simple call would reserve a batch of eggless pasta. Unfortunately, I was rebuffed several years ago after they moved to a new location in Chapel Hill with rude staff who essentially said that there were no vegan options anymore (hard to believe! ), and my wife in the past few months had a similar experience. But last night when I called, I was warmly received by a vegetarian staff person. The food was good but we felt the restaurant could use a bit of a makeover - rather plain dishes and utensils, and furniture, walls, and bathrooms showing signs of age. We had their one vegan pasta custom made with artichokes and sundried tomatoes, and several side dishes. They make everything to order and our waiter was polite and knowledgeable about veganism. The owner, Hank Straus, came over to meet us. Tomorrow is a vegetarian society potluck dinner. I'm not sure what I'll make, but since I won't be cooking an entire dinner, there will be no entry here till Sunday. 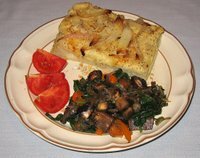 Tonight I made a saute of several types of mushrooms with onions and Nate's Savory Mushroom vegan "meatballs". I added a little bit of some unusual spices to this dish, such as ginger and turmeric. I also grilled asparagus. At Whole Foods Market today, they had an interesting pineapple-cucumber gazpacho; I purchased it and we enjoyed it - though it had a bit too much jalapeno (or other hot pepper). 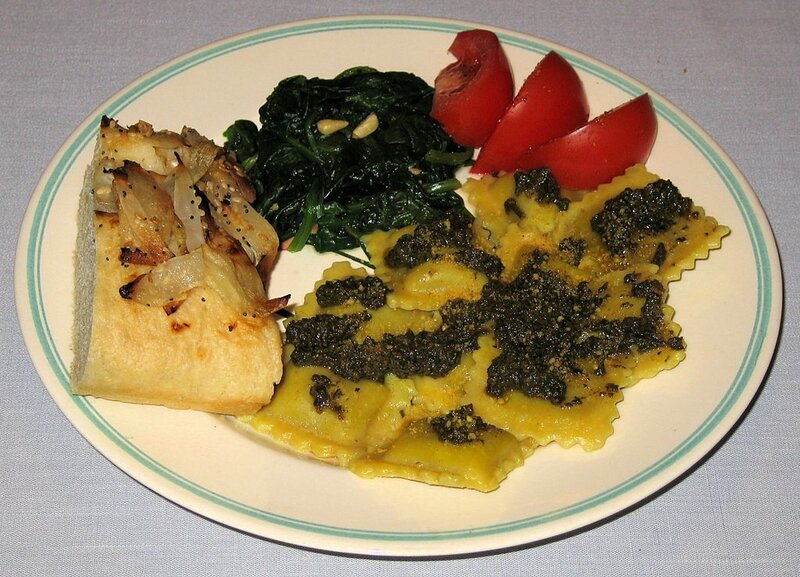 I picked up another variety of Rising Moon Organics' vegan ravioli, Garlic and Roasted Veggies and served it with pesto. I like raw or steamed spinach, but my wife prefers it cooked, so I briefly boiled and spiced spinach, adding pine nuts. Tonight I was shopping and found some spinach ready to be eaten; when I asked for any fresher spinach, the kind man in produce offered to sell me two bunches for the price of one! So I cooked more than half today and will probably make another spinach dish tomorrow. I coarsely chopped two portobello mushrooms and added them to a saute of shallots already underway for a few minutes. After 7-10 minutes, I added the spinach and wilted it for a few minutes, adding various spices such as ginger and Key Lime and pepper seasoning, as well as some hot sauce and fresh thyme (which we received from friends we stayed with on Cape Cod a few days ago; I had the timely joke of telling my friend, a retired doctor holding thyme he had just picked, that he had a lot of thyme on his hands!). I also added some orange bell pepper near the end. I also served some purchased onion bialy focaccia that I heated. It was such a pleasure, more than usual, cooking tonight, as we had been away for over a week. We drove to Connecticut for a family reunion and visited Cape Cod. We had some good meals with family in Connecticut, at It's Only Natural (a very nice vegetarian restaurant in Middletown, CT), with a very kind Servas family we visited on the Cape, at Pizza Uno (the stores receive vegan dough and "parbake" cheese into it before making pizzas; if you call them in advance, which we always do, they can make a vegan cheeseless pizza with dough reserved for you without cheese) enroute home, and at other places. Last night we got home late; my wife made a simple Indian flat rice "poha" dish and I helped her to grill a vegan sausage.